The events in December followed the repossession of a property by private security personnel days earlier. A MAN IN his 50s, arrested this morning as part of an investigation into a number of incidents which took place on a farm in Co Roscommon in December, has been released without charge. A garda spokesperson said that a file will be prepared for the Director of Public Prosecutions. He is the seventh person arrested as part of the investigation into the incidents which took place at a farm in Falsk, Strokestown, on 16 December 2018. Two men have been charged to date. 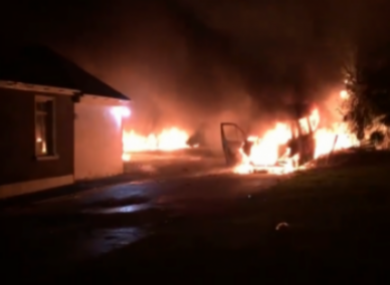 During a subsequent incident at the property, eight people were injured, three of whom required hospital treatment, while vehicles were set on fire and a dog that was seriously injured had to be put down. The eviction led to a number of protests and the issue was raised in the Dáil. Gardaí said investigations are ongoing. Email “Seventh man arrested over Strokestown eviction incident released without charge ”. Feedback on “Seventh man arrested over Strokestown eviction incident released without charge ”.